There are two important question to ask before teaching an animal a new skill. In another blog post, I discussed the first question, one that is extremely basic but often overlooked: “what is the cost/benefit of the behaviour”. Is it useful, useless, abuse or an ethical dilemma? Once a behaviour has been found to be useful, it’s time to consider how to best go about teaching it. Which is the best technique to teach the animal how to perform a new skill? You know the old saying “All roads lead to Rome”..? With regards to animal training, the same is true. There are many ways to teach animals what you want them to do. There are many techniques to “get” behaviour. Some trainers may say: “this is how you train your dog to sit.” Or your horse to load in the trailer. Or your parrot to step up. Many novice trainers don’t realize that what their guru is teaching is but one way out of several. And perhaps it’s the best way. The most efficient. The fastest. The one that facilitates future learning. Perhaps it’s just what that particular trainer was taught. And that trainer’s predecessor. And so on. What bothers me with this way of learning about animal training is not that inefficient techniques get maintained. That’s unfortunate, but not alarming. To me, it’s the fact that unethical techniques get perpetuated that’s really disturbing. 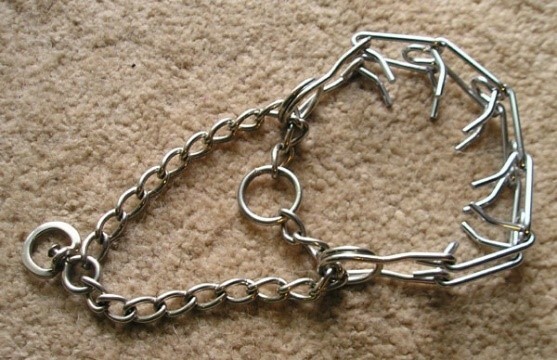 Like the use of prong collars for dogs. Doesn’t that look a bit like number 21 in “the 25 most brutal torture techniques ever devised”? Do I have a problem with this type of collar? Yes, I do. Will I go on a rant? No, I won’t. I’ll stay detached. Though I did write a blog post about the dangers of dog collars a while ago. For now. But beware of ranting below – I’ll give fair warning though. Back to the prong collar. This device was designed to keep dogs from pulling on the leash. It accomplishes this by providing discomfort and pain when the leash is taut. So, pressure on the leash is uncomfortable or painful, and the dog will avoid it. Actually, as long as he’s doing anything but pulling the leash taut, he should be “safe” – whatever prong collars feel like when pressure isn’t applied. Don’t know, I’ve never tried one of those – they’re forbidden in Sweden. But Grisha Stewart tested one in this video, and said they’re uncomfortable / painful even when there’s no pressure on them – and that the presence of fur doesn’t reduce the sensation. On a walk, the dog might be behind, in front of, to the left or to the right of the person. As long as the person doesn’t jerk on the leash, all these positions would be equally acceptable to the dog – and the dog would have no further information about whether any of these positions would be preferable to the person walking the dog. 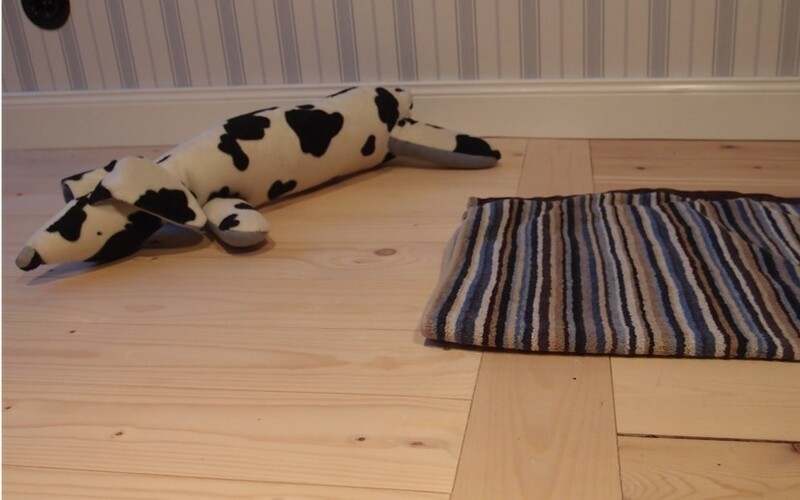 When the dog performs an undesired behaviour, something nasty happens, so the dog stops doing the unwanted behaviour in order to avoid the aversive stimulus. That is actually the modern definition of punishment. In semi-technical terms, pulling is punished. In fully-technical terms, pulling is positively punished. Punishment is a lousy way to teach desired behaviour. By definition, it only teaches the animal what not to do – any number of different behaviours can stop the aversive stimulus. Punishment has a huge list of unwanted side effects too. Do I have a problem with punishment? Yes, I do. Will I go on a rant? No, not yet. I’ll just drop this topic for today. Though I did write about the 20 problems with punishment here. You want the dog to walk nicely by your side when you go for a walk? You need to communicate this to your pooch. Don’t use punishment when he doesn’t do what you want. As strange as it may sound, “stop pulling” is not what you should be communicating. Rather, reward him when he does what you want. “Walk next to me” is the message you want to convey. To get desirable behaviour, we need to focus on reinforcement. Wanna get behaviour? Use reinforcement! There are several ways of getting behaviour through the process of reinforcement. The key to reinforcement is giving the animal something he values – contingent on the desired behaviour. You reinforce when the criterion for that behaviour is met. He will then repeat the behaviour in order to get more of whatever you’re offering that’s valuable. 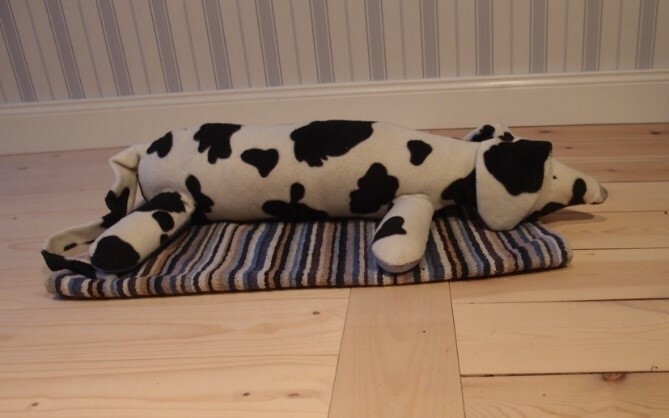 For instance, say you want your… cow-dog… to lie down on a towel. Reward her for doing it –and she’ll do it more. This is what reinforcement is all about. It renders behaviour more forceful. Re-inforces it. Behaviour becomes stronger, more intense, more frequent. Actually – technically, we’re not giving rewards, we’re giving reinforcers – because of the effect that they have on behaviour. Rewards may sometimes reinforce behaviour, but sometimes not. If you’re not seeing behaviour change, you are, by definition, not using reinforcement. OK, great – but let’s say that the cow-dog isn’t on the towel? How do I get her there so I can reinforce her in the first place? What if this is the current behaviour – if you reinforce that, you’ll get more of something you don’t want! So, how do you get from what-you-have to what-you-want? Actually, there are a bunch of different ways. Again, don’t punish your cow-dog for not doing what you want. Rather, communicate what you want using one of these 7 techniques. As you’ll see, I like some better than others. Seven ways of getting behaviour. Generally, it’s important to choose a good, comfortable learning environment and set it up so that it’s easy for the animal to learn the intended response. Minimize distractions. Choose reinforcers carefully. Also, I’m just discussing how to “get” the behaviour, not how to maintain it or put it on cue. That needs to be considered too…! It covers the following section, and is a bit too technical for beginners, perhaps. Skip to the next section if you’re not consumed with curiosity. I should warn you that when Ranting I often revert to my scientific background rather than becoming foul-mouthed. So, expect 3-4 syllable words and bureaucratic sentences. I was hesitant whether to include pressure-release (a type of Negative reinforcement) on this list. It’s a problematic technique, but exceedingly commonly used – especially among non-trainers. I could have just omitted it. Instead, I chose to include it. Why? Negative reinforcement is arguably the most misunderstood term in the whole of psychology: many animal trainers don’t even know how to define it. I have the data to back up that statement, in case you’re wondering. Negative reinforcement is often used unknowingly, so many animals are inadvertently exposed to it. It’s got a bad reputation so nobody hardly talks about it, or teaches how to do it properly. I see negative reinforcement misused very badly – probably because of this ignorance. A negative spiral. Nobody discusses negative reinforcement; nobody teaches it – but still it’s used. And because nobody is teaching it, people are ignorant and mangle it completely. And who is suffering because Negative Reinforcement isn’t discussed? So, animals suffer, because animal trainers don’t teach about, or discuss, negative reinforcement. 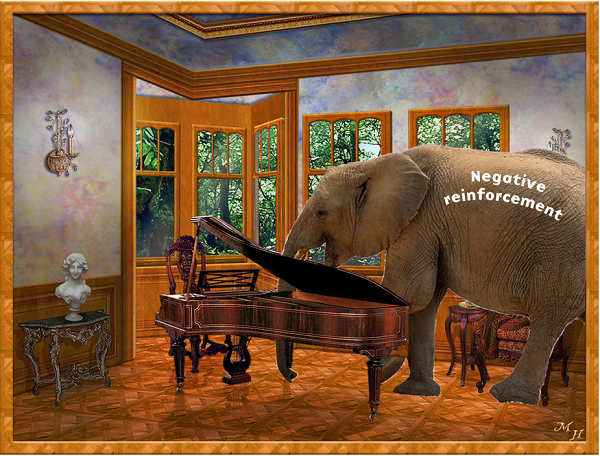 Negative reinforcement is the elephant in the room. I agree that positive reinforcement is the best way of training animals. But we don’t help animals by not talking about negative reinforcement. I’d even go so far as to say that not discussing it is a disservice to animals, pet owners and animal professionals. So, I think animal trainers have the obligation to discuss negative reinforcement training. At the very least so that people come to realize that they are perhaps unknowingly using it – and learn to minimize its potential harmful effects. People use way too aversive stimuli – frightening animals into a flight response rather than teaching them to move away from pressure. “Pressure” can be anything from gentle touching, to presenting a toy crocodile, to shouting, waving arms and spraying water. I see people unnecessarily going for the big guns right off the bat. People don’t remove the pressure when the animal starts responding. This implies punishing the correct response. Remind me, what term did I use, again, when discussing punishment of unwanted behaviour as a learning tool for teaching new behaviour? “Crappy” I think. “Lousy” comes to mind, too. Or perhaps it was “Inferior”? That was when punishing the unwanted behaviour. But punishing the correct behaviour? That’s … Exasperating. Not to mention unnecessary and potentially abusive. One reason I’m ranting. One reason animal trainers need to talk about Negative Reinforcement. I’ll try to stop ranting now. After all, this is “7 ways of getting behaviour”, not “Pontificating about what Animal trainers should be teaching”. Un-intrusive. How much control does the animal have of the learning and performance? Does he have choices? Is the technique potentially aversive to the animal? Will it impact the quality of the relationship? This, to me, is the single most important factor when deciding what technique to use. I realize others may prioritize differently, though. Fast. How quickly does the animal become proficient when learning the behaviour? How many repetitions does it take until the goal behaviour is shown? Precise. If you were to take pictures of the animal performing the newly learned behaviour several times, to which degree would they be similar? How close to the final goal can you get using only that technique? Resist extinction. How quickly does the newly acquired goal behaviour fall apart if you for any reason can’t provide reinforcement? Future learning. Has the animal learned something that will make future learning, using the same or other techniques, easier? Is the animal savvier? Does it understand the “training game” – and is it willing to play it again? Forgiving. If you make a mistake during the initial training stages, will this slow down or muck up training this behaviour – or future behaviours? 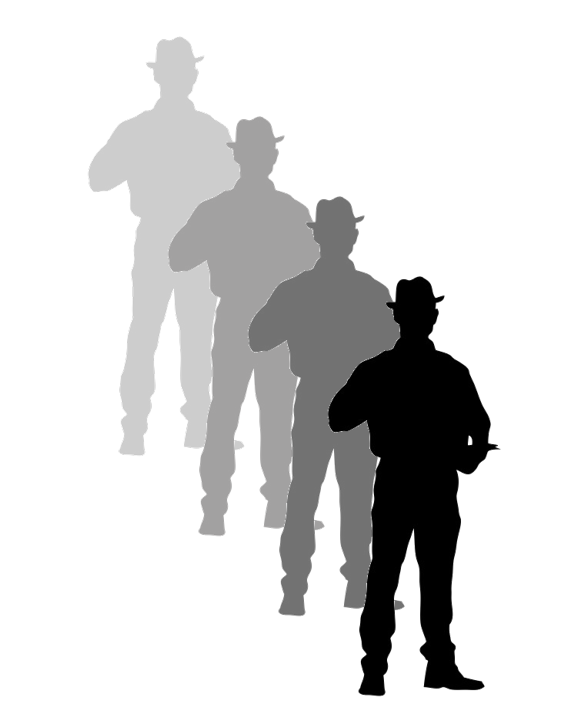 Skilled trainers often combine these techniques, thereby avoiding some of the downsides of using a single approach. In fact, the table below is probably completely useless to a skilled animal trainer, because they generally don’t perform the “pure” versions of these training techniques. They mix and match. Also, one hallmark of a skilled trainer is flexibility: the mix of techniques will depend on circumstance. For a beginner, though, combining these techniques might be difficult, and it’s useful to know how they compare when using “pure” versions of basic techniques. So, if you’re serious about learning about animal training, I recommend that you master these techniques – and learn in which contexts they are useful. This blog post doesn’t cover even half of it, but it’s a starting point. As seen below, there are many reasons to gear your training to positive reinforcement. Assuming that a naïve animal has been trained, and the behaviour has not yet become robust through repetitions, different techniques have slightly different outcomes relative to the others. I’ve been debating with myself whether I should actually include this table, since the little happy and grumpy faces imply that there’s solid data behind these. There’s not. What’s even worse, I am biased – so I’ve likely been unjustly harsh on methods that I dislike or am less familiar with. Also, a skilled trainer may use these techniques in a way that tweaks a certain procedure so it’s actually better than portrayed here. And an unexperienced trainer may do the opposite. But I really liked the idea of smiley faces illustrating this concept – so I included it anyway. That’s the perks of publishing on a private blog rather than in a scientific, peer-reviewed journal. Not only can I go off on a rant, but I also don’t have to back up every single one of the smiley faces with data. I can be speculative. 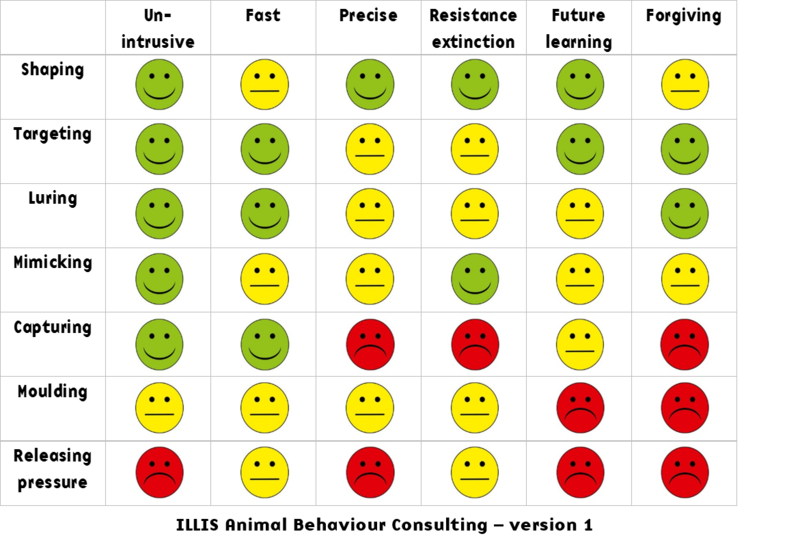 Regardless of whether the smiley faces all have the right colour, or even if we should make these relative comparisons at all, the important take-home is really to look at how your choice of training technique affects your animal given the place you’re currently at. Your skill level with each technique. The species you’re working with. How well you set up the environment before starting. The complexity of the behaviour you’re training. The value of the reinforcers. Still, I’m arguing that irrespective of these other influential factors, there are some innate differences in how these techniques tap into the animal’s learning mechanisms. All else being equal, outcomes should be slightly different if you’re going with just ONE technique. Which road will you take – and how can you shift it towards “greener smiley faces”? Let us know in the comment’s section, below! Interested in learning more about my online courses? Yearly admission is typically open for only a short while, so sign up to get notified when it’s time! I’ll also keep you posted on free webinars and new blog posts. Fugazza et al. (2015). Social learning in dog training: The effectiveness of the Do as I do method compared to shaping/clicker training. Hendriksen et al. (2011). Trailer-loading of horses: Is there a difference between positive and negative reinforcement concerning effectiveness and stress-related signs? Innes & McBride (2008). Negative versus positive reinforcement: an evaluation of training strategies for rehabilitated horses. Santos (2009). Limitations of Prompt-Based Training. Sdao (2008): Advanced Clicker Training (DVD). Zeligs (2014): Animal Training 101. Luring indeed… I would be very concerned with frustration-induced RAGE or the animal giving up altogether: it seems from the film that the animal doesn’t get reinforced too often…! By far, I find that negative reinforcement is the most difficult of the four quadrants to define. I look forward to the remainder of the reading resources. Glad to hear it! You’re welcome! Kayce, how exciting! Thank you for taking the time to dive into this post – will leave a few comments on your blog! 1. I am completely “positive re=inforcement” with dogs. I use food, toys, etc, etc. I try to focus on the relationship rather than a series of commands and am moving further and further away from ‘obedience’ modes the more experience and learning that I get. I have spent a long time considering whether it is different for prey and predators and I am of the opinion that it is but I am always open to having my views changed as more research and knowledge comes out. Why is it different? Well so as not to take up any more space I will say it simply but please understand that my explanation has many facets and nuances to it. However, on a simple level, dogs are pre-disposed to a reward system – chase food, eat it (the food does not come to the dog; only when it’s given by humans). Further, they have evolved like no other animal to be bonded to humans in a unique way to the point of dependence on humans for their survival . Horse have to LEARN a food reward system. They have also retained much of their innate survival instincts and despite the domestication process they have not evolved to ‘need’ humans in the same way. They are grazers, the food is just there they only have to walk around and get it. Teaching horses how to accept food as a reward from the hand (before they begin any training of behaviour/skills etc.) is the very big part that many horse owners/trainers miss out or do not do thoroughly enough and then wonder why they get bitten/mugged/hurt). It changes the fundamental nature of the horses processes. There is another aspect that I am exploring. Horses learn very quickly what is ‘pressure’/predatory and what is not – they have to in order to survive; if they kept on running they would die. This means that using this natural process is quicker but without compromising ethics or dignity whereas teaching some aspects by shaping techniques puts repeated stress and pressure on a horse for extended periods of time. A typical example: I wanted to teach my horse to go up some steps – we have a strong relationship; he did not want to go; I could have spent hours shaping etc. but I went up the stairs first, very slight pressure on his halter, he decided that I had ‘shown’ him it was safe and he wanted to release the pressure he went up the stairs – it took less than one minute. I feel it’s vital as you have so brilliantly explained to have a whole range of methods to ‘draw’ on depending on the need to the animal rather than the need of the human. Sorry, I’ve rambled on longer than I intended! Thanks for sharing your perspective! Interesting observation you’re making about predators and prey. I think you make an important point: they are differently wired when it comes to how vigilant they are, how responsive to potential threats..! Didn’t realize that horse trainers had a hard time teaching horses to work for food – that’s intriguing. What a lovely blog post. And great table with training methods analysis. I keep thinking about the last column – forgiving. I’ve seen many animals who are a living proof that pressure release, even if applied timely, is an unforgiving method, at least when it is the dominant training method. But would you say the degree of ‘unforgiveness’ of this method varies among animal species, or is it rather an individual thing? Ewa, so glad you liked it – and I added that column last, as it occurred to me when I was preparing this post. But I agree – it’s very important! Interesting question – I would expect that certain species would be more forgiving than others. For instance, it’s very often used with prey animals – and misused. As in: easy to trigger a flight response. I would expect predatory species to be less affected by pressure release training – but perhaps more risky too: easier to trigger a fight response. Big individual differences too, some individuals would be easily sensitized by that approach to training, others not. One thing I see a lot with negative reinforcement is simply that people see the word “negative” and assume it means “bad” when really in terms of the Skinner grid it’s a purely technical term. It often seems to conjure a very strong emotional response purely to the words. My experience is different from a lot of people because I train horses and over the last ten years or so I have gone out of my way to learn with some of the best trainers in the world. One thing they all have in common is that the training starts from negative reinforcement and that combining it with very refined timing and understanding of how horses feel about the world you can fairly quickly get to a point where horses are comfortable and relaxed in their lives- it often affects the way they feel about the world when they aren’t interacting with humans. There is also a degree of subtlety available with horses that means once you have established a relationship with one you are unlikely to need to think much in terms of reinforcement most of the time- it becomes something more like a conversation, albeit an entirely non-verbal one. If anything that is where things get interesting for me. Obviously different animals respond in different ways – I doubt what I know about horses would transfer well to many other animals – and with all techniques there are probably only a handful of people who are dedicated enough to have mastered them to an outstanding degree, but I thought this perspective might be interesting to you. Ben, thank you so much for sharing – that sounds really interesting! I agree that a lot of animal trainers get very emotional when the subject of Negative Reinforcement pops up. Unfortunately, so many people use it in ways that are unnecessarily harsh on the animal – or don’t even know what they’re doing. Glad to hear that you’ve been exposed to so many good examples. As always, complexity made simple, thus powerful. Shared with gratitude. I found your chart very interesting! Could you say a little about the red faces under capturing for precision and resistance to extinction? 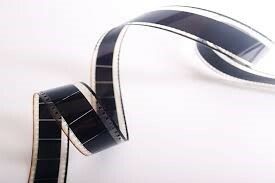 It seems like since the behaviors we capture are behaviors the animal already performs, as opposed to, for instance, performing weaves in agility, that they would be very resilient in the face of extinction. But even putting aside the nature of the behavior, why would the capturing yield poor resistance to extinction? The capturing part is only the very beginning of the training, after which we reinforce the behavior like any other. I also don’t understand about precision–capturing is one of the few times I use a clicker and I’ve gotten extremely precise behaviors that way. You have trained lots more animals than I have though, so am interested to hear your experience and reasoning. Hi Eileen – great questions! I agree that once established, captured behaviour would be resistant. But after the very first reinforcement it’s typically not. If the animal wasn’t paying attention, not in “training mode” or didn’t fully understand what was being reinforced, chances are that you won’t get the opportunity of a second reinforcement even if your timing was excellent the first time around. So, in these early phases of training, the response has no reinforcement history and is thus sensitive to extinction. Once repeated, reinforcement history builds and all that changes. An excellent enjoyable and thought provoking blog. Oh- did I ever enjoy this piece!! My friend, Ann has taught me the values of +R training- dogs, donkeys, mules…even my 15 year-old cat has learned a thing or two! In a way, it’s the way we (should) teach our children…”wow- what a great job!” followed by a happy face, a treat- wouldn’t we all do more for these rewards? Food, praise, attention…I know my dog thrives on “good boy” and extra-exhuberant rubs. Will be passing this along. Thank you.